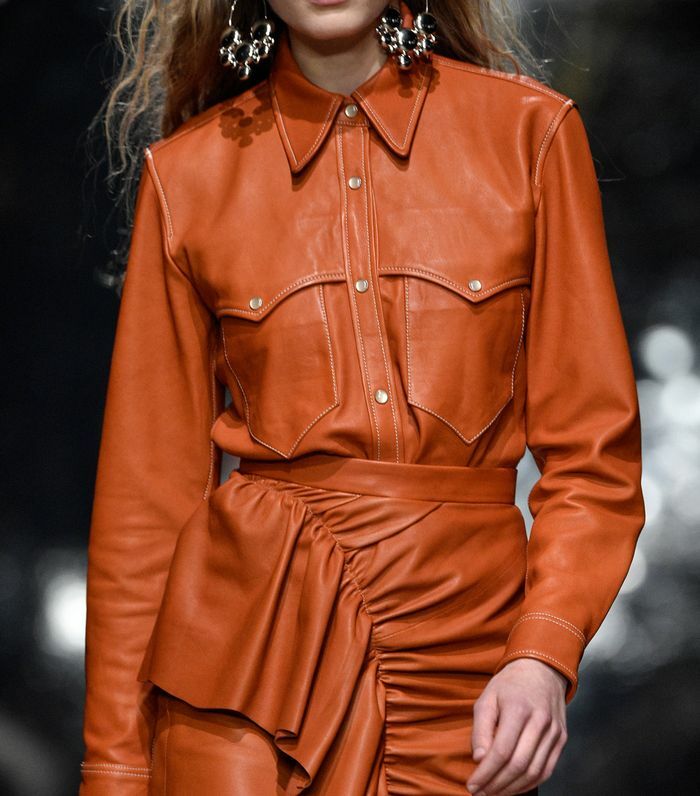 Leather isn't usually a fabric that makes its way into spring/summer collections, however, in 2019, leather shirts are going to be a key item along with linen dresses and cycling shorts. In 2018, many of us started dressing like Texan natives in cowboy boots and double denim, and the Western trend is continuing well into 2019. Designers including Isabel Marant, Nanushka, Victoria Beckham and Ganni have been bringing leather shirt back, and high-street brands are following suit as Warehouse and Uterqüe already have amazing leather button-down shirts. Nanushka's croc-stamped leather shirts have proved popular with the Instagram set, and they are all made using vegan leathers. "The vegan leather we are using isn't just buttery soft, but it's also sustainable because it completely cuts out the most toxic part: the tanning process," explains Sandra Sandor, founder and creative director of Nanushka. "I find it important that we make our clothes long lasting and find new methods to reuse them. That's why I always try to take the most care with all my pieces." Keep scrolling to shop Nanushka's vegan-leather shirts and some of our other favourites. Isabel Marant Nile Leather Shirt. Leather shirt at Victoria Beckham. Nanushka is a leader in vegan leather. This would look amazing with white jeans. Ganni is into this trend too. The short-sleeved version is great for summer. The white piping is a cool addition. This also comes in black. The longer silhouette sits amazingly with jeans. This has a fitted corset-style shape. We'd pair this with cowboy boots. This is another Western winner. Kitri is another brand creating amazing faux leather. The bow detail on the collar is a cute addition.